Art by Leinil Francis Yu. U.S. Agent is a fictional superhero appearing in American comic books published by Marvel Comics, usually those starring Captain America and the Avengers. He first appeared in Captain America #323 (November 1986) as Super-Patriot. He was later redesigned as a new incarnation of Captain America and, just a few years later, as U.S. Agent. In 2012, U.S. Agent was ranked 29th in IGN's list of "The Top 50 Avengers". The character John Walker was first introduced as the supervillain Super-Patriot in Captain America #323 (November 1986). Mark Gruenwald created Walker to counter the general message in Captain America of patriotism being invariably good, describing him as someone "who embodied patriotism in a way that Captain America didn't—a patriotic villain. Basically, I just wanted to do the opposite of Steve Rogers. Okay, Steve Rogers is a poor northern urban boy. So I'll make a guy from rural middle class south. Cap is now old, so this guy'll be a real young up-and-comer. Cap has lofty ideals, so I'll make Super-Patriot be more realistic and more pragmatic. So, I put together his background and character traits by playing the opposite game." With Iron Man, for example, we had James Rhodes take the lead character's place, and we did it for two years—which I'm sure was about a year and a half longer than anybody thought we would do it. In Thor we had Beta Ray Bill take Thor's place for two or three issues. So, this is the sort of thing that has been done to shake up people before. You know, I'm responsible for it in Iron Man and I was editor of Thor at the time of Beta Ray Bill, and believe me it's a trick I know works because I've seen it work a number of times. It's just to get you noticed so that people who don't normally read it will say, "Oh, I heard something about this, let me read it and see." And with luck, folks will get hooked on the storyline. John Walker's installation as Captain America indeed provided a major boost to the series's sales, and he remained the main character of Captain America for issues 333 through 350, during which his character generally becomes more heroic. In Captain America #354 he is given another name and costume change, this time as U.S. Agent using a discarded costume of Steve Rogers (the original Captain America), a black outfit with a different alignment of the stars and stripes to differentiate it from Steve Rogers' suit. During the events of the "Maximum Security" storyline, U.S. Agent was given a new uniform reminiscent of riot police uniforms. He continued to use that uniform in his 2001 miniseries, which followed the events in "Maximum Security" and was written and drawn by Jerry Ordway. John Walker was born in the fictional town of Custer's Grove, Georgia. He grew up idolizing his older brother, Mike, a helicopter pilot who died in the Vietnam War in 1974. John wanted to live up to the memory of Mike who was idolized by their parents, and so later enlisting in the military, becoming a soldier himself. John served at Fort Bragg, although it was never specifically stated what unit he was attached to. Unfortunately for John he served during peacetime and so never managed to become the hero that he perceived Mike to have been. After John received an honorable discharge from the United States Army, he was told by a friend about the Power Broker, a mysterious individual who gave people superhuman abilities. [volume & issue needed] Walker and his friend received treatments that granted him superhuman abilities. John Walker as Super-Patriot. 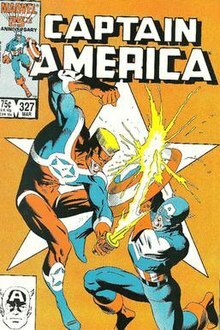 Cover of Captain America#327 (March 1987). Art by Mike Zeck and Bob McLeod. Walker, now in debt to the Power Broker, intends to join the Unlimited Class Wrestling Federation but meets Ethan Thurm who becomes his manager and persuades Walker to become a hero instead. Thurm secures financial backing, helps Walker design a costume, and sets out a strategy that allows him to debut as the corporate-sponsored Super-Patriot, who then travels the country promoting his image to the nation through patriotic rallies and community service. At a rally in Central Park, he holds a secretly rehearsed performance in which he publicly criticizes Captain America and is subsequently attacked by three extremist supporters of Captain America called the Bold Urban Commandos or "Buckies". Walker defeats them in the staged fight as a demonstration of his combat prowess and patriotism. Captain America confronts Walker privately afterwards and demands that he stop using the Buckies, since people attending the rally could have been hurt in a panic resulting from the staged attack. Walker refuses, arguing that his actions are justified by his quest to replace the outdated Captain America as the nation's symbol. When Captain America repeatedly refuses his challenges to a fight, Super-Patriot attacks him. Although Captain America proves to be a more skilled fighter and lands blow after blow, a trash-talking Walker manages to absorb the attacks. With neither man falling after a lengthy brawl, Super-Patriot flings a number of throwing stars at Captain America. Captain America is too tired to dodge. One hits him in the chest, embedding into his uniform but doing little to no actual physical damage. With the successful strike, a gleeful Super-Patriot claims victory and promptly departs. A weary and dejected Captain America tries to tell himself that the fight was a draw, as neither man actually went down. But he is nonetheless left questioning his own fighting abilities while acknowledging Super-Patriot's superior strength and stamina. Walker truly catches the eye of the nation though when he tackles a terrorist named Warhead who threatens to detonate a nuclear weapon in Washington, D.C. atop the Washington Monument. Walker scales the monument, disarming him with a throwing star, before sending him plummeting to the ground below. Warhead – preferring to go out 'like a man' – kills himself before hitting the ground by detonating a hand grenade. This high-profile act makes him an instant celebrity, appearing in The Washington Post and on national television where he claims himself to be "America's future", which in turn brings him to the attention of Valerie Cooper in her role as a Presidential advisor. Walker is the second Super-Patriot character in the Marvel Universe. The first Super-Patriot debuted in Nick Fury: Agent of S.H.I.E.L.D. #13 in July 1969 and would never appear again. The original Super-Patriot's costume bears no resemblance to that used by John Walker. Soon after, the original Captain America, Steve Rogers, abandons his costume and identity when ordered to report directly to the Commission on Superhuman Activities, feeling that Captain America had grown beyond the name's original role as a symbol of America during the war and not wanting to be tied down to a political agenda. The Commission debate who should become the new Captain America, with Nick Fury and Sam Wilson (the Falcon) both being considered as candidates, although it was considered that the former was too old and would not want to give up the autonomy he enjoyed as Director of S.H.I.E.L.D, where as in the case of the latter they did not believe that the United States was ready for a black Captain America. Dr. Valerie Cooper, a member of the Commission, suggests that Walker should be made the new Captain America, as a U.S. government operative. Though repulsed by the notion of giving up being Super-Patriot and taking on the identity he has criticized so much, Walker ultimately answers, "Ma'am, if Uncle Sam wanted me to be Mickey Mouse, I'd do it." In becoming Captain America, he is forced to abandon Thrum as his manager, and can only retain one of the "Buckies", Lemar Hoskins, since the other two fail to pass background checks. Hoskins is partnered with Walker as the new Bucky, but Hoskins later changes his codename to "Battlestar" due to the negative racial connotations of the name for a black man. They follow the orders of Adrian Sammish. Walker is trained by Freedom Force, the Guardsmen, and the Taskmaster—Taskmaster's training focusing on teaching him how to use Captain America's shield—and goes on his first mission against The Watchdogs, a militia group. Another of Walker's early acts as Captain America was a mission to "aid stability and democracy in South America" by teaming up with the Tarantula in order to hunt escaped political dissidents from his home country on behalf of its oppressive regime in order to silence them. Despite believing in the fight against Communism and in the principle of helping America's "Democratic allies in Latin America", Walker becomes increasingly uncomfortable with the methods used by Tarantula after he interrogates and threatens occupants of an immigration detention center for information on his targets. The two battle and wound Spider-Man, however Walker – increasingly conflicted by the fact that both the immigrants who Tarantula interrogated and Spider-Man looked upon him and the uniform he wore with fear, seeing him as an enemy – decides to walk away, convincing himself that this course of action was not something that Captain America would support. Spider-Man ultimately defeats Tarantula and Walker later learns that the individual who gave him his orders to help Tarantula was a rogue agent who did so without legal authority, beating him and telling him that the uniform he wears is supposed to inspire, not terrify. The two rejected "Buckies", now calling themselves Left-Winger and Right-Winger, crash the press conference arranged by Cooper to reveal the "new" Captain America and Battlestar, and announce Walker's name and birthplace on national TV. His parents are subsequently killed by The Watchdogs; this incident drives Walker closer to a mental breakdown, particularly when the Commission orders him not to step out of line in the future, resulting in him missing his parents' funeral due to his new responsibilities. In a state of rage, he kills many of the Watchdogs, and beats Left-Winger and Right-Winger to a pulp, leaving them to die in an explosion. They are left terribly burned and in critical condition. [volume & issue needed] Walker is then captured by Flag-Smasher, but rescued by the original Captain America, Battlestar, and D-Man. The Red Skull, now in a clone body of Steve Rogers, lures Walker to Washington, D.C. The Skull attacks Walker with a horde of Walker's enemies, but Walker kills or critically injures them all in a single brawl. The Red Skull arranges for Walker to confront Captain America—now using the identity and costume of "the Captain"—but Rogers defeats him and confronts the Red Skull. Walker wakes up and throws his shield at the Red Skull, causing him to be exposed to his own "dust of death," giving his head a reddish skull appearance, but the Skull escapes. Rogers and Walker give a report to the Commission, which returns the uniform of Captain America to Steve Rogers. Rogers declines the offer, but Walker persuades him to reconsider and accept it. At a press conference announcing the return of the original Captain America, General Haywerth fakes Walker's assassination by a Watchdog in order to set up John Walker in a new identity. To address Walker's psychosis, he is hypnotized into believing his parents are still alive, and he would not recover his full memory for many years. He is also given a new cover identity of 'Jack Daniels' as well as speech therapy and work to erase old mannerisms in order to help hide the fact that he was the man the public had recently seen "assassinated". Walker soon resurfaced as an adventurer, the U.S. Agent, wearing a variation of the costume that Rogers had worn as the Captain and using his vibranium disc as a shield. Walker continued to work for the Commission. He was first seen as the U.S. Agent, battling an Iron Monger as a test for the Commission. He was placed as a watchdog of West Coast Avengers and the Vision by the Commission, as a condition to possibly get their government clearance reinstated. Some time later, he rescued Battlestar from the Power Broker, and reconciled with him; Walker learned that his memories had been altered and that his parents were dead. The manner of his appointment to the West Coast Avengers team, and his own abrasive attitude, saw U.S.Agent frequently come into conflict with his colleagues, in particular the headstrong Hawkeye (Clint Barton), which culminated in a battle between the two that saw them both suspended. He later almost killed Spider-woman (Julia Carpenter) – an ex-employee of U.S.Agent's employers Commission for Super Human Activities – hesitating over delivering the fatal blow before collapsing in grief – his guilt over his long history of violence catching up with him. While under the employ of the Commission for Superhuman Activities, U.S. Agent was charged with the responsibility of taking down the Punisher (Frank Castle). U.S. Agent locates the Punisher and after some hand-to-hand combat, the Punisher discloses that he is attempting to take down the Maggia; he agrees to help the Punisher, vowing to take him into custody once they had done so. Agent takes down the superpowered mercenary Paladin, who had been employed to kill the Punisher by the Maggia, breaking both of his legs with his shield. Ultimately the Punisher upon completing his mission escapes U.S. Agent by dressing a deceased henchman in his uniform and leaving him in a burning building, convincing U.S.Agent that he had perished in the fire. U.S. Agent is berated by his employers who inform him that his job is to act, not think and declaring that it is no wonder that he failed as Captain America. U.S. Agent walks away halfway through his dressing-down. U.S. Agent was once more forced to choose between following the rules and laws of the nation he had dedicated himself to serving, or ignoring them in favor of doing what he personally believed to be right, when he investigated a series of gruesome murders of illegal immigrants on the Mexico/U.S border who he later discovered were being committed by a corrupt law enforcement official. Later, U.S. Agent muses that just like Holloway he had done things as a hero that he feels he needs to make amends for, but promises that unlike Holloway he will find the true path to salvation. U.S. Agent fought alongside the Avengers in several battles. After the Avengers moved to a United Nations based charter, he received only one vote (though not from himself) in the ensuing vote and consequently lost his place on the team. Even with his personality conflicts and reckless behavior, he soon proved himself worthy of being an Avenger and was able to rejoin. U.S. Agent also helped the team battle the likes of the Lethal Legion, Dr Demonicus and his Pacific Overlords, Ultron and his robotic 'bride' War Toy, the 'Night Shift', the 'Bogatyri' – a group of Russian extremists intent upon ushering in a new Cold War, 'Death Web' – a team of spider-themed villains, and Immortus. U.S. Agent, along with fellow "replacement" heroes Thunderstrike (Eric Masterson) and War Machine (James Rhodes), was manipulated into battling the heroes who had inspired them – Captain America, Thor, and Iron Man – by the time travelling villainess "Terminatrix", before putting their differences aside to team up against their common foe. U.S. Agent along with the rest of the West Coast Avengers, the Avengers and the X-Men, participated in the 'Bloodties' crossover, during which Professor X attempted to negotiate a peace to end the civil war on the island of Genosha. [volume & issue needed] U.S. Agent was charged with the responsibility of acting as bodyguard for Professor X.
Captain America sarcastically cited U.S. Agent's use of his "famous powers of composure and diplomacy" as one example of the recent failings of the West Coast Avengers when he indicated his intention to shut the team down. This provoked U.S. Agent's fury, who raised his hand to strike Captain America; Iron Man stopped him and uttered, "Not now. Not ever". During this time, U.S. Agent was featured in a Marvel UK comic called Super Soldiers, initially battling, then teaming up with American and British soldiers empowered by a variation of the drugs that created Nuke. When the West Coast Avengers dissolved, he dumped his U.S. Agent costume and shield into the Hudson River. Soon after, most of the then-current members of the West Coast Avengers were asked by Tony Stark to found Force Works. Initially the Agent was reluctant, however Scarlet Witch later persuaded him to join, stating that she needed the Agent to be the team's "backbone" and intended to run the team on tight military lines and the values of strength and dedication that Agent had shown her during their time together on the West Coast Avengers. U.S. Agent ultimately joined the new team, wearing a new costume and using an energy-based shield provided to him by Tony Stark. Stark describes U.S. Agent as a "loose cannon", suggesting that he could have an identity problem, expressing the desire to develop a new look for him "to get U.S. Agent out of Captain America's red, white and blue shadow". The two agree to put their spat aside and sleep, with U.S. Agent telling Hawkeye that he will be taking him back in the morning regardless of any objections, however when U.S. Agent wakes Hawkeye is gone – although he leaves him a note thanking him for helping him get some things off his chest, and letting him know that he is not all bad after all. U.S. Agent was briefly referred to as the Liegeman in Avengers Vol. 3 #2–3 as it was the codename for him in the Morgan le Fay verse. U.S. Agent briefly appears in Captain America (Vol 3) during the 'American Nightmare' story arc attempting to steal an experimental jet plane. Captain America stops him, and U.S. Agent is later seen in stasis along with others affected by the villain Nightmare. He eventually became the field leader of the Jury, a group of armored corporate vigilantes, owned by Edwin Cord, owner of Cordco. U.S. Agent again wearing his original U.S. Agent uniform and now using an eagle-shaped shield that could be directed in midair via remote control. The Jury's job was to take down the Thunderbolts, but they were defeated by the Thunderbolts and their new leader Hawkeye, a former Avenger teammate of Walker's. The Jury attempted to apprehend the Thunderbolts a second time, but instead the two groups joined forces together against Brute Force and the soldiers of the Secret Empire. U.S. Agent was severely beaten to near death by Protocide. Due to emergency medical procedures performed on him, he was outfitted, by S.H.I.E.L.D., with an enhancing exo-skeleton. Following his recovery, he soon adopted a new costume and rejoined the Commission on Superhuman Activities, with the position at the head of the federal government's U.S. Marshal division, called S.T.A.R.S., the Superhuman Tactical Activities Response Squad. The group battled alien invaders and superhuman threats and was responsible for their imprisonment. In this role, he was placed in charge of coordinating Earth's heroes during the 'Maximum Security' crisis when Earth became a prison planet, claiming that he was needed to prevent the other heroes getting 'sidetracked' by their concern for the prisoners to ensure that their focus remained on what was best for Earth. U.S. Agent continued to work for S.T.A.R.S as America's super human 'top cop' under the observation of Valerie Cooper. In this role his former love, and current agent of S.H.I.E.L.D, Kali Vries—who he had endured Army boot-camp with many years previously, and who had bested him in almost all physical tests—was thrust upon him as second in command. U.S. Agent was uncomfortable with Vries' appointment as she had previously jilted him, although she was still affectionate towards him. Other S.T.A.R.S agents warned Agent that Vries was playing him. Vries is later revealed to be in the employ of ambitious Senator Warkovsky and on his order places a parasite capable of allowing mind control on U.S. Agent's neck. In their second mission together U.S. Agent and Vries teamed up to tackle a radical faction of Atlantians working with the super-villain Poundcakes (Marian Pouncey). It transpired that Pouncey was attempting to trade more of the alien parasites capable of mind control with the Atlantians. The Sub-Mariner (Namor) disrupts the battle and discovers the parasite placed on U.S. Agent's neck by Vries. Vries later attends Agent's room and attempts to seduce him, placing another parasite on him. U.S. Agent—apparently no longer in control of his own will, and despite being informed that a S.H.I.E.L.D envoy had been dispatched—then takes the duffle bag full of parasites seized by S.T.A.R.S in order to take them to his manipulator who transpires to be none other than the Power Broker (Curtis Jackson)—the man originally responsible for granting John Walker his super-human powers, whose plan is to infect the International assemblage of Heads of State with the mind-controlling parasites. At this point Captain America (Steve Rogers), who had been revealed to be the S.H.I.E.L.D envoy responsible for collecting the parasites, along with Kali Vries, burst into the meeting between U.S. Agent and the Power Broker. Power Broker places a parasite on the neck of Senator Warkovsky intent upon influencing his address to the International assemblage of Heads of State, but is interrupted by U.S. Agent who is subsequently assaulted by Captain America intent upon stopping him. The two battle with neither of them able to gain the upper hand. Meanwhile, Vries is captured by the Power Broker who reveals that he had been attacked and left for dead by aliens during the 'Maximum Security' crisis at which point, barely alive, he had become the host for an alien which produced the mind-controlling parasites, subsequently attempting to expand its control by infecting influential individuals. Power Broker then infects Vries with a parasite. Eventually Agent manages to escape Captain Americas attentions long enough to reveal the presence of the parasite on Senator Warkovsky's neck and removes it with his energy baton. Together Cap and Agent fight off the crowd of V.I.P's (also apparently under the control of the Power Broker), escaping and then teaming up to restrain both Power Broker and Vries and removing the parasites from each of them. Dum Dum Dugan then appears on the scene to inform U.S. Agent that Vries, far from being a traitor, was actually a deep cover agent acting on behalf of S.H.I.E.L.D with the intention of gaining Senator Warkovsky's confidence and discovering who was using the parasites and attempting to take the mother-parasite into custody for study and as evidence. Agent destroys the specimen and then speculates that he didn't believe it to be alien at all but rather a product of a government genetics lab that went wrong. Dugan is suspicious by his silence and shocked when Captain America indicates that he believes U.S. Agent's accusation. U.S. Agent is later seen deep in thought, looking at a photo of himself and Vries during better times and reading a letter of apology from her for her deceptions. He later burns the photo before running out of his room after being informed that there is an assignment for him, declaring "I love this job!" U.S. Agent leaves his interviewers with one piece of advice: "I go out there to save lives. You just pay the bills. Just be good little bean counters – and pay em!" Clockwise from top left: Human Torch (Jim Hammond), Captain America, Sub-Mariner, Union Jack (Joseph Chapman), U.S. Agent, and Blazing Skull on the cover to New Invaders #1, with art by Scott Kolins. 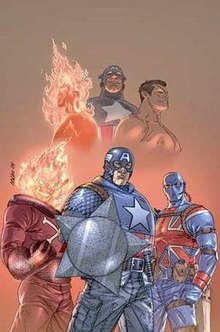 Walker eventually became a member of the New Invaders, wearing a Captain America-like costume, serving alongside the likes of the original Human Torch, Union Jack (Chapman), and the Blazing Skull until the team disbanded. U.S. Agent's first task was to negotiate the release of the Blazing Skull from captivity at the hands of middle Eastern terrorists. It is revealed that U.S. Agent can speak fluent Arabic, but he is forced to exterminate the terrorists when they renege on the agreed deal. The New Invaders then team up with Namor and his Atlantean forces in order to overthrow the government of Mazikandar – an alliance Namor agrees to because Mazikandar has been choking the seas with pollution by sinking oil tankers in an effort to control supply to the USA. Ultimately U.S. Agent is defeated by Rogers. Mazikandar's dictator is presented to his hand picked successor, who promptly executes his predecessor on the steps of the capitol building to the surprise of both the Invaders and Avengers alike. The fighting ends when Namor announces that he has formed an alliance with Mazikhandar, and that it is now a protectorate of Atlantis thus giving the Avengers no need, and no power to remain. The U.S government, needing to counter the threat first created an elite strike force – the New Invaders – then equipped them with a battleship named The Infiltrator, capable of travelling the world unseen and armed with tactical missiles with the ability to drop entire cities into sub dimensional space. Walker insisted on being called Captain America. 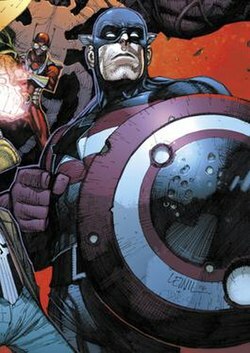 Captain America (Steve Rogers), while attempting to close down the New Invaders, threatened Walker with legal action over his use of the uniform, stating that he owned the copyright to it. Walker informed Rogers that he had only taken the role in the first place because Rogers had refused the Thin Man's invitation to lead the team and that they had to show their enemies "that Captain America is not afraid to fight!" While Walker initially proved to be unpopular with many of his new allies, he later gained their respect, in particular winning over Namor who had been a close ally of the original Captain America, Steve Rogers. Walker saved Namor from a brainwashed and murderous Wolverine, who had been resurrected by The Hand during the "Enemy of the State" storyline. The badly injured Namor later offered Walker his personal thanks. Eager for revenge, U.S. Agent's defeat gives Tony Stark the leverage to finally persuade him to join Omega Flight when he reveals that the Purple Man has fled north himself. Weapon Omega eventually realizes that he is being manipulated and that his handlers intend to continue to use him even against his will, however this is stopped by the U.S. Agent who having discharged himself from the infirmary despite his severe injuries. Dr. Benning boasts that as a fail-safe had been activated, all evidence of her manipulation of Weapon Omega had been destroyed. It is at this point that Omega reveals that one of the individuals whose powers he had absorbed had been a technopath, and that he had accessed all of Benning's confidential records and sent them to Tony Stark. Weapon Omega then exposes Benning to a glimpse of the hundreds of personalities within his being, leaving her in a vegetative state. He then vows to become a hero rather than a weapon and is last seen assisting the people of Alaska—the location where his powers had first manifested, resulting in the deaths of the original Alpha Flight team. During the Dark Reign, U.S. Agent is removed from Omega Flight by Loki (disguised as the Scarlet Witch) to aid Hank Pym in defeating the reality-altering Chthon. Initially the pro-registration U.S. Agent finds himself in combat with the anti-registration Hulk and Hercules, but they later endeavor to team up against their common foe. Chthon's power is tied to Wundagore Mountain and U.S. Agent plays a part in separating him from that source by planting explosives in order to destroy it. The team ultimately defeat Chthon, and U.S. Agent quits the Omega Flight team – with their blessing – stating it was an honor to serve with them, but 'once an Avenger, always an Avenger'. Following their victory, U.S. Agent joins the Mighty Avengers. The team is sent on various missions including saving the Infinite Avengers Mansion from becoming untethered from reality. On a mission to China investigating the Unspoken (a former king of the Inhumans), U.S. Agent is devolved by Xenogen gas which turns him into an Alpha Primitive. He attacks the current Captain America, James "Bucky" Barnes while in this condition. Quicksilver convinces him to attack the Unspoken by saying "The Commies will win!" Hank Pym later creates a new shield for U.S. Agent after his previous shield was destroyed by the Collective Man. U.S. Agent was one of the Avengers who joined Hercules in his Assault on New Olympus. He said he believes that the Gods are just people with super powers and battled against Eris, Goddess of discord. Following a conflict involving a Cosmic Cube-empowered Absorbing Man and the Dark Avengers, U.S. Agent is stripped of his rank by Norman Osborn. U.S. Agent and several members of the now disbanded Mighty Avengers are called upon by Amadeus Cho during the events of Siege. Their mission is to stop Norman Osborn's Thunderbolts from stealing Odin's spear from the Asgardian armory. After engaging the Thunderbolts in battle, Nuke uses the spear to sever U.S. Agent's left arm and leg. As thanks for his service during the siege of Asgard, John Walker is appointed the new warden of The Raft maximum security prison. The injuries he sustained during his fight with Nuke have left him wheelchair bound and using a prosthetic arm. He refuses to repair his body using more technologically advanced prostheses because he does not want to become a cyborg like the man who crippled him. Walker engaged an inmate in hand-to-hand combat during a prison riot, demonstrating that he could still hold his own despite some limitations. The warden was influential in establishing the new Thunderbolts beta team, appointing Songbird team leader and handpicking the new candidates. During the Fear Itself storyline, Juggernaut heavily damaged the Raft before escaping, causing a prison break. This triggered a security fail-safe in one section of the jail which reversed the air supply, eventually creating a fatal vacuum. Walker set out to override the system, which could only be done in person. He was assisted by Ghost, who earned Walker's respect after protecting the lives of the ungrateful inmates. Walker also rallies other help, inmate and powered alike, to assist him in his duties throughout this crisis. Norman Osborn escapes the Raft due in part to traitors on staff (one had a shrine to Osborn), which leaves Walker under a cloud of suspicion. In August 2012 a teaser image for the Dark Avengers displayed U.S. Agent's traditional red, white and black shield followed by the tag line 'EVIL is our only HOPE!'. The Dark Avengers team are thrown into an alternate world where, while unconscious, U.S. Agent is examined by an alternate reality Hank Pym and determined to be "John Walker, ex-Marine Captain." June Covington is seemingly able to restore his lost limbs with help from this reality's version of the Venom symbiote in lobotomized form. During the AXIS storyline, an inverted Doctor Doom recruits U.S. Agent to join his version of the Avengers in order to help fight the now-evil Avengers starting with Scarlet Witch when she invades Latveria. During the Civil War II storyline, U.S. Agent meets with Paul Keane, president of Keane Industries, who, along with others, asks him to convince Sam Wilson, the current Captain America, to give up the shield and stand down. At first John declines the request, out of respect for Steve's decision to share the mantle with Sam, until they see a news report about Sam and former New Warrior Rage fighting the Americops, a private police force funded by Keane Industries. After Sam escapes from the Americops, U.S. Agent attacks him from behind by throwing his shield at his back. He then tells Sam that he needs to stand down, saying that he is out of control and that he should hand over the shield. Sam refuses, acknowledging his mistakes when he assumed the mantle, and the two begin to fight, with John gaining the upper hand due to his powers. Sam defeats him by dragging him into a tunnel, where the darkness and the great horned owls that live in it gave him the advantage. It is later revealed that John never wanted to fight Sam until Steve approached him and convinced him to do so, saying that Sam has lost his way and needs to stand down. U.S. Agent was then reported missing in action on a secret mission to Syria, with a possible implication that his disappearance may have been the result of the now evil Steve Rogers' machinations. During the Secret Empire storyline, U.S.Agent appears briefly alongside the resistance forces, including fellow former West Coast Avengers teammates Mockingbird and Tigra. Together, they battle the Superior Octopus (Otto Octavius) and the forces of Steve Rogers' Hydra organization which took over America. He would later join a team of heroes recruited by Captain Marvel to hunt down the Punisher for his actions when he was a member of Steve Rogers "Secret Empire". As a result of the experimental mutagenic augmentation process conducted on him by Dr. Karl Malus on behalf of the Power Broker, John Walker has superhuman strength (capable of lifting ten tons under maximum exertion), agility, reflexes/reactions, and endurance. His speed, dexterity, coordination, and balance are of the order of a superior Olympic athlete. Aside from the above advantages, U.S. Agent is an exceptional hand-to-hand combatant and highly trained in gymnastics and acrobatics, having received rigorous training in unarmed combat and the use of his shield in a style similar to Captain America's own fighting style by the Taskmaster. He is a seasoned combat veteran with military combat experience in tactical and strategic planning, observations, and special operations, has been shown to have a fluent grasp of the Arabic language, is technically proficient enough to bypass an advanced security system, is a qualified fixed-wing pilot, a trained scuba diver, and is highly proficient in the use of conventional firearms. He is capable of using his nearly indestructible vibranium shield for defensive purposes and as a weapon. He has great accuracy at throwing his shield and due to his superhuman strength, it is potentially a lethal weapon. Agent has used a variety of shields in his time, initially inheriting Captain America's indestructible circular shield after Steve Rogers had relinquished it upon quitting the role and refusing to work for the Commission for Super Human Activities. U.S. Agent was later provided the Vibranium replica of this shield provided by Black Panther and used by Steve Rogers when Rogers adopted the title of 'The Captain'. U.S. Agent then briefly adopted a remote control shield against Hawkeye and the Thunderbolts. During his time with the New Invaders, U.S. Agent possessed a star shaped shield with retractable spikes. [volume & issue needed] The shield was decorated with the names of Americans who had died at the hands of terrorists as well as a photograph of U.S. Agent's parents. The U.S. Agent also wears synthetic stretch bulletproof fabric. After being badly injured by the villain Protocide, U.S. Agent was fitted with an exoskeleton by S.H.I.E.L.D. that allowed him to continue to walk, and according to then-Director Sharon Carter may have also provided "An additional benefit or two". After being crippled by Nuke, John Walker lost one arm and one leg. Electing to use ordinary low-tech prosthesis, he retires his U.S. Agent identity, and no longer has access to his weapons and gear. However, he still retains his full capability to act in self-defense. At one point, the Agent used wrist guards which produced an energy shield as well as energy blasts. U.S. Agent's costume incorporated a "thought relay receptor" that picks up his mental commands and shapes his shield however he wills it. In U.S. Agent's own words "It's better than the old trash can lid!" In his first costumed identity as the Super Patriot, Walker wore a costume that was capable of stopping multiple shots from a handgun at point blank range, and also used throwing stars and a flame torch. In an alternate reality John Walker becomes Captain America and battles with Steve Rogers, with only the intervention of Nick Fury and then-President Ronald Reagan bringing the hostilities to an end. Regan gives a speech in which he enshrines the importance of helping the government against foreign enemies and in support of domestic affairs, but also the importance of America as a nation of individuals – ideologies represented by Walker and Rogers respectively. His speech is cut tragically short however when the head of the Commission, Douglas Rockwell, assassinates Rogers by shooting him dead on the orders of the Red Skull – who has secretly been planning Rogers downfall and was close to seeing his plans fail. In light of Rogers death, the President requests that John Walker become the new Captain America, however as it was before, Walker is lethally violent, and with no Steve Rogers alive to stop his fury he goes unchecked until the nation burns. Eventually Walker is stopped and imprisoned in the Vault for his crimes, but the government – realising that the man inside the costume was far more important than the costume itself – decide to retire the role of Captain America and consign it to a museum. Later, the Red Skull visits the museum, stands below the memorial of his greatest foe – a foe now utterly destroyed and reduced to nothing but a memory – and laughs as he has finally triumphed. In another dystopian alternate reality in which Captain America's (Steve Rogers) icy tomb was not discovered by the Avengers until much later in history, U.S. Agent is once again a villain, working for an oppressively right wing United States government and going by the name of "American Agent". In one panel, U.S. Agent is shown as one of the surviving heroes. He questions why Magneto is present, to which Nick Fury answers "anyone who is not a zombie is an ally". In the Ultimate Marvel universe, "Major" John Walker appears in Ultimate Comics: X-Men #9 as a high-ranking official at Camp Angel, a facility used to house mutants in the aftermath of 'Ultimatum'. The camp appears to be complicit in the beating and torture of some mutants. When the news breaks that all mutants are actually the result of secret government experiments a riot breaks out at the camp led by the X-Man Storm. John Walker of Earth 9907 is the deputy leader of the Thunder Guard—that Earth's feared super human police force. SS Agent has a costume and photonic energy shield similar to that worn and used by USAgent during his time with Force Works. He first appeared in #10 of Avengers Next. Though Force Works frequently appeared in the Iron Man TV series, the U.S. Agent was replaced by Hawkeye. He did appear in the connected 8 issue series Marvel Action Hour: Iron Man. U.S. Agent appears as a palette swapped version of Captain America (Steve Rogers) in Marvel Super Heroes vs. Street Fighter, with winning quotes. U.S. Agent appears as a supporting character in Marvel vs. Capcom: Clash of Super Heroes who can assist the player in battle with a special move. U.S. Agent is an alternate costume for Captain America (Steve Rogers) in Marvel: Ultimate Alliance. U.S. Agent is a playable character in the Marvel Super Hero Squad video game, voiced by Nolan North. The U.S. Agent costume can be used as a costume for Captain America (Steve Rogers) in Marvel Heroes. In 1990, ToyBiz produced a U.S. Agent action figure for their Marvel Superheroes toyline. The figure was merely a repaint of the previously released Captain America action figure. In 1995, ToyBiz released an action figure line for the 1994 Iron Man animated series. A U.S. Agent action figure was produced but never made it to mass market. However, the figure eventually did get released in international markets and the odd short packed case. It became one of the more valuable figures in the line. ToyBiz did release the original version of the figure at a convention, that version usually sells for 2–3 times more than that of the international release. The figure was later remolded to become the Astral Armor Professor Xavier in the X-Men toy line. U.S. Agent is in the Marvel minimates license. He is a two-inch figure that comes with his shield, and a repainting of Blade's belt. He appears in the pack with the Taskmaster. A U.S. Agent figure in his original costume is part of the Comic Series segment of the action figure line from Hasbro based on the 2011 Captain America movie. As of 2012 Hasbro introduced a 6-inch U.S. Agent wearing the original costume into Wave 3 of their Return of Marvel Legends line. ^ a b c Zimmerman, Dwight Jon (January 1988). "Mark Gruenwald". Comics Interview (54). Fictioneer Books. pp. 5–23.